Arne Guttormsen Brekke celebrated his 90th birthday! In 1949 a young man (see college yearbook photo left <) traveled to America to study at Luther College in Decorah, IA. His plan was to spend a couple of years studying and then return to Norway where he would make his living teaching English in one of the Universities. In the Luther College Chips (student newspaper), February 11, 1949 it said "...in 1947 Arne passed a comprehensive exam that qualified him for a junior standing in American college work. He arrived in New York on January 18  and came directly to Decorah to enroll for a second semester. His interest in medicine was founded when he was a member of the Norwegian Medical corps during the last war. Arne's plans for the future are indefinite, but upon completion of his work here at Luther, he may go on to med school or else return to Norway as an English instructor." However, the 'universe' had a different plan. He met a woman, fell in love and decided to live in America, but would make frequent trips to Norway. At 6' 2" and slightly over 200 lbs, Arne was a good looking man. He and his fiancee, Beverly Wade Boardman, a 1951 graduate of Wheelock College, were married February 7, 1953 in her hometown of Newton, Massachusetts. Beverly was just shy of 24 at the time of their marriage. 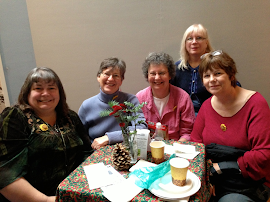 Children came quickly: a son Kristian in November 1954, a daughter Karen in January 1957 - both born in Decorah - and then in June of 1960, while living in Chicago, they welcomed a second daughter, Karla. Arne was born October 19, 1927 in the village of Flåm, Sognefjorden Norway. [Note: you can read a current article about flåm in the Scandinavian Press • Summer 2016 issue, p. 42-45.] The village is located in the municipality of Aurland in Sogn og Fjordane. He became a U.S. citizen in January 1961 while living in Chicago. His love of travel extended throughout his life. He made a career of organizing travels to Norway (and beyond) with the company he established: Brekke Tours & Travel. 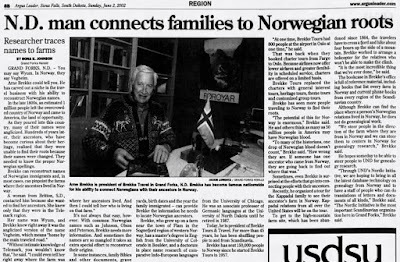 In June of 2002 the Argus-Leader, published in Sioux Falls, South Dakota, published this article about Arne and his passion for connecting families to their Norwegian roots. For me, the more impressive news article, appears in the SCANDINAVIAN PRESS • Summer 2014, pages 32-37 (see the photo at the top right of this post). It's actually two articles: one written by David Dodds about Arne's work as a travel guide (which first appeared in the University of North Dakota Discovery magazine • Autumn 2012) and a second article by Jo Ann Winistorfer about the Chester Fritz Library on the UND campus in Grand Forks. In Ms. Winstorfer's article, she refers to Arne as 'the Grand Forks guru of a Norwegian phenomenon known as bygdebøker." There's actually a photo of Arne hanging on one wall, with the heading "The Arne G. Brekke Bygdebok Collection". "Do you realize the magnitude of this collection? he tells us. "It's one of the largest accumulations of bygdøbker in the world, even bigger than those in Norway!" Wishing you the very best in identifying your ancestors in a bygdebok!